i like the way that tire looks. You told me where to find the Kenda skinwalls that i had on but those things just could not hold up to my riding. Less than a month the back tire wore down to the tube. and i know what you’re thinking and NO i did not slide my back tire when i stop. it was from normal wear and tear. so needless to say i had to put my Maxxis tires back on and they serve me good. I would definitly try finding these tires though as long as they have a pretty good reputation. Wow…I have always wanted to go on a one-man crusade. Seriously. I’m thinkin I might try to bring back threaded forks. Or how about lay back seat posts? (or just seat posts in general) I also really miss caliper brakes. Maybe that’s the ticket. Remember when freestyle was more like a one-man crusade? It took something more than a bar spin tail whip variation to be considered creative? I miss that as well. Maybe I will go on a one-man crusade to bring back freestyle creativity. But then if I go on a one-man crusade I might just be copying your one-man crusade for skin walls. Would that take a way from the creativity of it? Would I be starting a new trend where every rider has a one-man crusade to go along with their slammed seat and lack of brakes? Sorry gentlemen. I need coffee. I think someone has already started a crusade to save the seatpost (layback or otherwise)…check out “Bring the seatpost back to BMX” (http://seatpost.wordpress.com/). That blog is the best…..oops……I mean second best. Somewhat on topic – I just put a hundred psi in my KHE park tires (warned about on this blog) on my newly acquired model c and rode it down my drive way. I did a 180 and the front tire blew. Sounded like a 44 mag round fired two inches from my ear. I think my neighbors called the cops and told them I shot my wife. If I don’t post for a while you know where I am. which I have been running since they came out. I have had these for months on my Model C.
Note, if you want to slam your back wheel of your Model C to give your front more lift only go with a front one of these as the rear will leave you with 2mm both sides of the chain-stays which will allow for zero buckling! 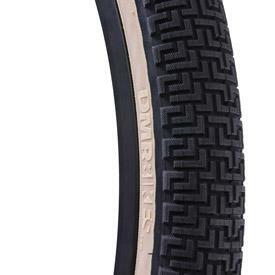 Also I have spoken to DMR extensively about the tires being made in kevlar for the 24″ and they don’t exist, the distributers have it wrong,DMR told me that the tooling for kevlar in this size is far too expensive for the number of tyres they think they would sell so they definitely have no plans for a 24″ kevlar tyre at this stage. Thanks for letting us know how the DMR Supermotos worked for you! I thought for sure that I had seen somewhere that the 24″ version was available in kevlar…but a quick check on the DMR site confirms that a kevlar version is only available in 26″. Good to hear that they hold up to park and street! anyone find a way to get these in the US? QBP doesnt seem to carry them. I found a UK website, but they would be $75 shipped to Cali.